The Bridgestone 350 GTO is only a minor variation of the 350 GTR which first made its appearance in 1967 and has changed little since. The GTR, with its low pipes, was a sleek, harelike machine, softened with gentle curves in the tank and seat. The only thing the manufacturers have done to create the GTO is to replace the original muffler system with a pair of huge, high mounted silencers in gun-metal black, tipped with chrome stingers, and add a cross brace to the handlebars. it's a simple change, but the result is wild. The design becomes much busier. You can no longer call it subtle, or sophisticated, or sleek, It definitely looks cobby, and the exhaust pipes appear though they are an afterthought. The engine aera does not suffer , as the beautifully polished induction case covers are in full view, but the total effect is somewhat nervous. Riding the GTO is rather like riding a two-wheeled exclamaion point! Hmmm, what's that?'' the man on the street kept saying to us from every gas station and parking lot. Apparently not everyone in this country seeks to be sleek, soft or subtle, So, good for Bridgestone. Beneath all the flash, there does lie some substance. 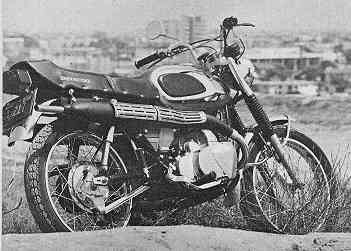 Bridgestone was the first motorcycle manufacturer to mass- produce a rotary-valve Twin. 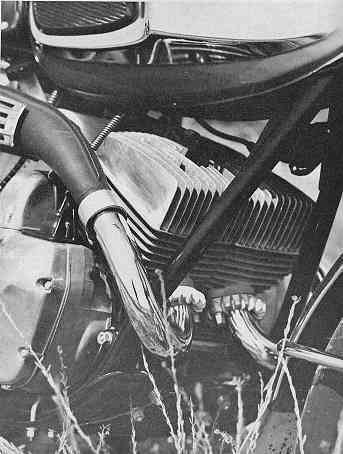 In 1967, the new 345-cc powerplant was quite innovative and offered advanced features. In 1970, though virtually unchanged, the machine still holds its own and is considered quite advanced technically. Following what has become the normal approach in building a rotary-valve Twin, the engine features a covered carburetor on each side, feeding the fuel into the crankcase through a port timed by a slotted disc. In addition, the Bridgestone offers a six-speed gearbox, and a dry, racing-type clutch. As is the case with most Japanese two-strokes, oil is mixed with the gasoline by a metered pressure injection system which supplies oil to the main bearings and then lubricates the connecting rod big end, wrist pin bearings and cylinder walls before mixing with the gasoline and being burned and ejected out the exhaust system. The oil supply is regulated by the throttle opening and works quite well, but, as with almost every other Bridgestone we've tested, the oiling system is set a little on the "juicy" side, perhaps to avoid seizure during the first few hours of running with a tight, new engine, So, until the system is readjusted, the machine tends to smoke heavily. Otherwise, the Twin is a smooth, potent performer with a broad power band and relatively moderate power peak of 7500 rpm. It pulls well from about 3500 rpm, but this power is accompanied by vibration which increases in severity as the revs build up. It wouldn't be quite so noticeable except that the rider's legs are usually resting on the heat Shields of the upswept exhaust pipes, and as they are quite wide and tend to carry the vibration, they make the machine uncomfortable for long stretches in the saddle. 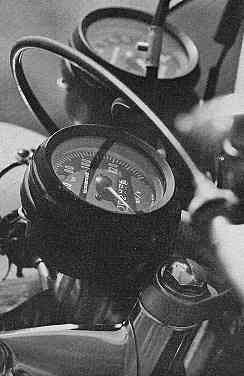 Starting, aided by a handlebar mounted choke lever, is usually a two or three kick affair, and, as with most two strokes, warm-up is only moderately fast. Once warmed up, the Bridgestone becomes quite tractable and exhibits a good mid-range torque, which was particularly useful when riding two up. As the engine is in a moderate state of tune, one might wonder why Bridgestone went to the added expense of building a six-speed transgression when a five-speed would have been sufficient. The extra gear really isn't needed, unless you consider sixth gear as a sort of overdrive. It all begins to make sense when you get out and run down the highway at 70 mph. The engine, maintaining its pulling power at moderate engine speed, will handle that top gear quite slickly, even though it's turning only 1000 rpm for every 13 mph. At 70 mph, the rev counter reads just over 5000 rpm, which is leisurely for a medium displacement two-stroke. Thus, noise and vibration levels are reduced somewhat at highway speeds, with the added benefit of lower engine wear. The shifting arrangement is quite Japanese in that the gear selector lever is on the left foot pedal and neutral is at the top of the shifting sequence. The lever is pressed downward to engage each higher gear until it stops at sixth gear. It is not a rotary shift as in certain other Bridgestone models (for which we are thankful), so shifting is done by pulling up sequentially on the lever to get back from sixth gear to first and then to neutral, The selector shaft protrudes all the way through the right side of the transmission case so that the GTO can be adapted for right-hand shifting, which would give an old-style English shifting pattern with two extra gears. It's rather difficult to tell which gear you are in, there being so many of them. You lose count. Then you discover it doesn't really matter until you are on the highway, wondering whether you are in fifth or have shifted into sixth. Bridgestone solved this problem with an indicator light on the speedometer dial which illuminates when fifth gear is engaged. Some argument could be made for having it light in sixth, but as fifth gear is more likely to be used as top gear in city riding, leaving the light go on in fifth gear gives the rider a reference point for two adjacent gears rather than just one. Shifting action is solid, easy and positive, the result of a well designed and constructed shifting mechanism.acting upon a cylindrical shifting drum which actuates three shifting forks traveling along grooves in the drum. The gear ratios are well spaced, but the seven-plate dry clutch is a bit tricky. The reason for having a "racing type'' dry clutch, as opposed to the more common wet plate variety, the Bridgestone people say, is its quick, positive action. Yes, it's so quick that rushing off the line at high rpm in low gear invariably results in all or nothing grabbiness, which will leave strips of black on the pavement. A start at moderate rpm produces a more normal start and the engagement is normally progressive. Once away and rowing through the faultless transmission's six gears, the real benefit of that clutch can be felt; you can smack it home as hard as you want and it won't slip. In our test of the near identical GTR at the time of its debut in 1967, we commented on its good tracking and rigidity-the products of a well conçeived double-cradle frame with a four-point mountain for the swinging arm. As the GTO is basically no different, we were surprised to be greeted with a "hunting" action at the front end at speeds of 65 mph and above. Sometimes it would start of its own accord in a straight line on the freeway, but it would occur most often when the machine was heeled into a fast bend, particularly if the road offered any sort of deflection. This phenomenon didn't seem to arise from any lack of rigidity in the frame or swinging arm assembly, and we could find no logical explanation for it. At slower speeds, the GTO felt light and nimble, and was a joy to ride in traffic. Steering was light, due in part no doubt to the 3.25-19 rib front tyre, but we wondered why the rear tyre was the same size. It does not look out of place, but it was barely adequate in width for the machine's considerable horsepower. In general, the GTO offers a very pleasant riding experience due to the firm but comfortable springing and the well conceived positioning of the seat, handlebars and footpegs. The shape of that beautiful fuel tank gives the rider a just-right place to grip with his/her knees. Even the visual aspect of sitting on the machine is enhanced by the businesslike pair of black dialed instruments at the front. Around town, or for short trips out of same, the GTO is at its best. The low first gear makes it ideal for maneuvering when traffic comes to a virtual standstill, yet the overdrive top gear keeps the fatigue factor to a minimum at high speed. And getting slowed from high speeds is no problem with the GT0's powerful brakes, a double-leading shoe in front and a single-leading shoe at the rear. Fade was quite low and control proved to be excellent.